Around 5,000 visitors will see our full-colour, A5 souvenir programme booklet. The programme will be available in advance from local distribution points, and will also be delivered to village addresses, and handed out to visitors on the day of the fête. 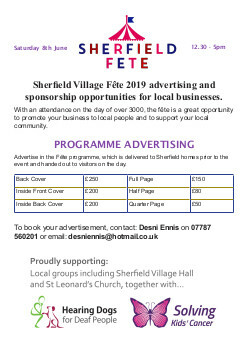 If you’d like to advertise in it, we offer space in various sizes at very reasonable rates, designed to cover the booklet’s production cost, and help more of the fête’s proceeds go to our charities and good causes.